The historic St. Paul’s Church at Fulford Harbour on Salt Spring Island, British Columbia, Canada. The historic St. Paul’s Church at Fulford Harbour on Salt Spring Island is a building I’d seen photographs of even before visiting Salt Spring Island. I do a fair amount of research online before I visit a location so I have a good idea of some specific places to visit while exploring in between. The trouble with this particular building is I wasn’t able to find out where it was, only that it was near Fulford Harbour which is a bit vague. Thankfully St. Paul’s Church is right next to the main road out of Fulford Harbour heading towards Ganges, and it was pretty easy to spot once I got close. 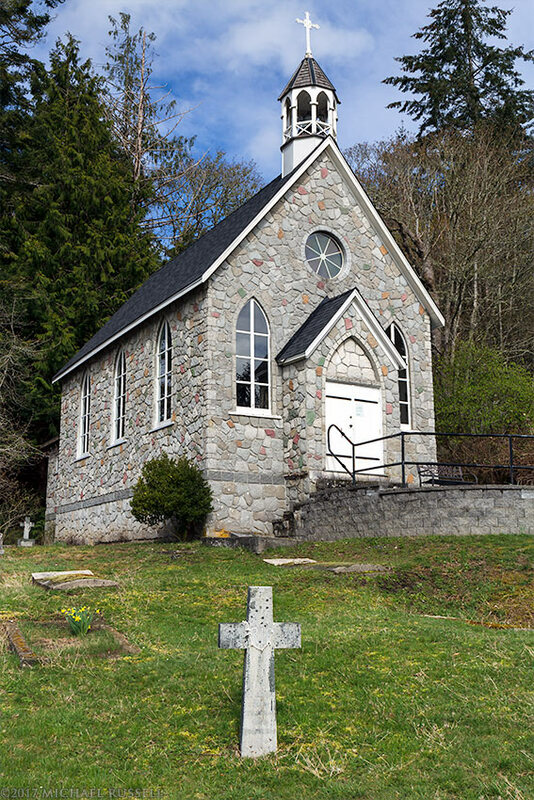 Saint Paul’s Church is Salt Spring Island’s oldest church and was built between 1880 and 1885. Founded in 1878 by Father Doncklele who was the first Roman Catholic missionary on the Gulf Islands. The windows, front door, and bell were acquired from the “Butter Church” in Cowichan Bay and brought by canoe to Burgoyne Bay. The colored stonework on St. Paul’s Church was added in 1973. To an outsider like me this stonework feels appropriate for Salt Spring but I can also see the point many make that this kind of expression is not appropriate for historic buildings such as this one. The cross in the foreground is part of the church cemetery and marks the resting place of Alan Blackburn (1865-1925). There is not a lot of information about Blackburn online but Blackburn Lake is named for him in the area he purchased his farm. For more photographs of the Fulford Harbour area visit my Salt Spring Island gallery.